With Valentine's Day around the corner, I feel like it wouldn't be right if I wasn't making something with a heart theme. And one thing I've been trying for two years is to make beaded candy hearts... The ones that have sayings like 'Be Mine'. The pure sugar, cotton candy color ones. I guess that made me try and go the totally other direction from super sweet to more modern romance with this ultra-W I D E peyote stitch ring. Even though style-wise it is very out of character for me, I really like it. 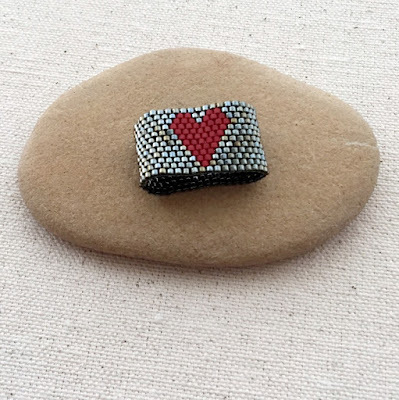 There is a step by step to make the beaded heart ring plus a pattern, but the word chart (if you prefer that) is at the bottom of this post. Here's one more look at my wide and industrial inspired color ring. 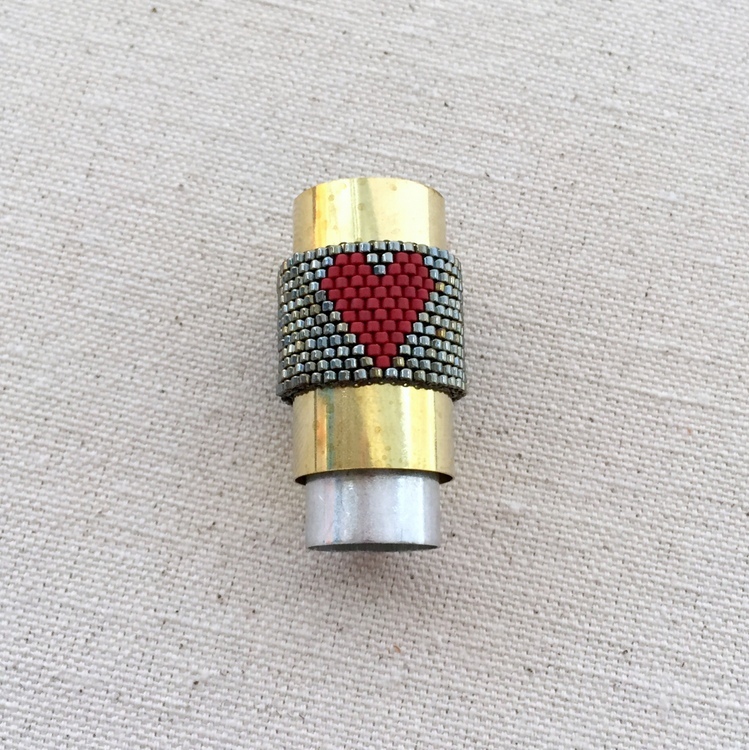 I love the combination of the steel metallic beads with the matte opaque beads. Something I'll have to try again. The steel beads have lots of flash and are a little multi-colored metallic. I also like that I can turn the heart in towards the inside of my hand when I'm not feeling the love and the wide band ring is still stunning. So, that's my recent success story. Now about those candy hearts... Ugh! 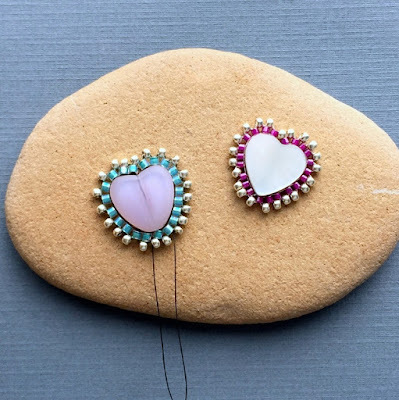 The plan for the candy heart design started last year when I found the dyed shell heart beads in my stash - which was during my bead brick stitch around everything phase. (A phase that is still going on!). At first I gave the beads to my daughter. They're pretty, but the colors were light blue, pale pink, yellow and light green. They just seemed like something she would love and I would never use. And then Valentine's Day came near and I thought they would be perfect - and reclaimed them. The beading I added was ok - but it didn't compare to what was in my head. A little too pale, maybe? Another one of my not quite there projects is some wire wrap keys - old fashioned barrel keys. I think a lot of people refer to them as skeleton keys, but I'm pretty sure they're real name is barrel keys. I wear a Tiffany key that my daughter gave me and I've always had a fascination with this type of key. Lots of character and variation - and they are a popular motif in jewelry the last few years. 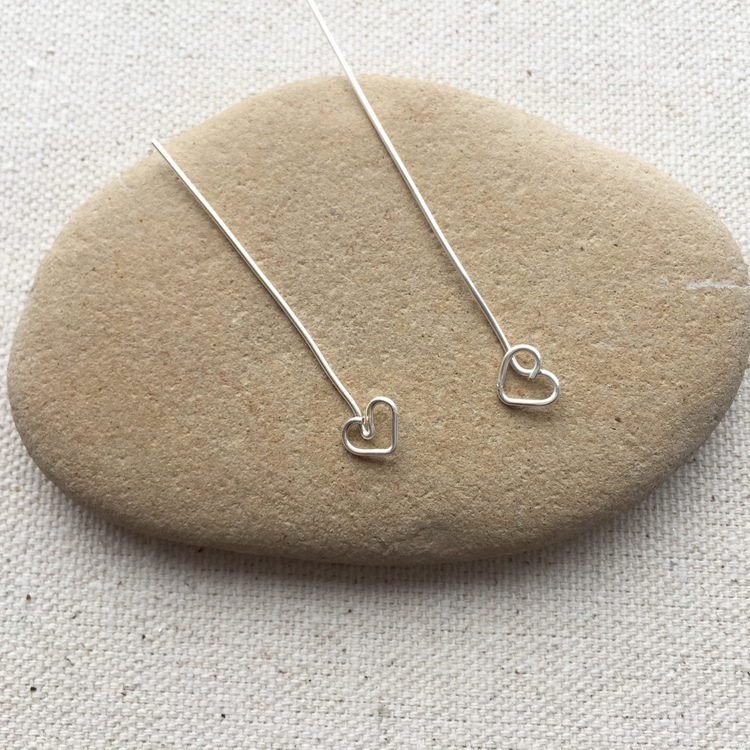 I had been thinking about how to make barrel keys a bit when I was playing with wire and made these heart shaped headpins. The one on the right seemed like the perfect shape for the notch part of the key. And then I stumbled upon the bag of miscellaneous metal tubes from the CHA show. And these key designs are the result. Still very rough since I am trying to work out the proportion as well as design, but there is some hope. I will probably switch to a thinner metal tube for the barrel. I'm also considering adding beading to the top of the key. It would probably need to be directly on the wire shape at the top, so the key is double sided. At the very bottom of this post, you'll find the word chart for the Peyote Heart Ring Tutorial. I'd love it if you would follow me on social media to keep up to date with my latest posts. You can sign up for email notifications or follow me on Facebook, Instagram and other popular sites. I tried the needle in the first row technique for my peyote. It kept slipping out on me and messing me up so I wanted to share what I did. As I added a bead and stitched I pulled both sides sideways making sure to push the foundation row to the stop bead. Delicas literally snap into place and it kept it nice and tight on the first row. I only lost about a sixteenth of an inch of thread using gravity to my advantage. I LOVE this stitch! I was always using brick stitch before and this goes so fast!! !